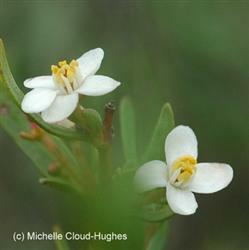 This medium-sized evergreen shrub has aromatic white flowers, whose shape will remind you of citrus blossoms, which is not surprising since both are in the same family. It produces very attractive red fruit that look like tiny oranges with red patches. The fruit has a very intense citrus flavor. Some people are allergic to its shiny green leaves. It grows naturally in the chaparral on mesa tops, and due to development is seen less and less in the wild. Bushrue is slow growing but attractive and interesting. Bushrue survives with very little water.